Living so close to the Pacific Crest Trail, I get to see a lot of the footwear chosen by thru-hikers. This year, the two biggest hits were the Altra Lone Peak 1.5 and the Brooks Cascadia 8/9. It’s easy to see why the Altra Lone Peak works so well for through hikers, with a wide toe box, breathable upper, and versatile outsole. The only knock on the Lone Peak that I heard from hikers had to due with the shoe’s durability, with some reporting blowouts of the upper and pre-mature wear of the outsole. It’s hard to judge a shoe based on the reviews of a through hiker, as they’re putting 20+ miles on a shoe daily though some pretty rough stretches of the PCT. I picked up a pair of the 2.0, when I saw that they were changing the outsole, and increasing the stack height of the midsole to offer more cushioning. My initial impressions have been positive overall, with only one major gripe. Note: I wear a size 12.5 in the Lone Peak 2.0 which is true to size for me. The new design of the Lone Peak is incredible, gone are the days of the subdued early models from Altra. This is a huge step in the right direction, as the Paradigm, and Olympus models that I run in look equally good. The material used on the upper is very soft on the feet, and does a great job of keeping the foot cool, while keeping out dirt and debris. These shoes handled perfectly on a really hot day out at Claremont Wilderness Park. The lacing system works well and keeps the midfoot snug without any overlays. The toe guard has not been called into action, but it’s nice to know it’s there without having to be reminded. Just like all of Altra’s offerings, the zero drop and footshaped toe box fit my foot perfectly with no alterations. Altra hit another homerun with the midsole of the Lone Peak 2.0. Running on hardpack, loose gravel, and a few rockier areas, I really appreciated the rock plate and substantial cushioning. The Lone Peak offers great protection without feeling soft or mushy, it’s the perfect balance. I’ve been running in these and the Olympus, and ‘hands down’ prefer the ride of the Lone Peak. The Olympus is just too soft and too much cushion. The outsole is where the shoe really bums me out. The traction was great on all of the surfaces I ran on, and I never felt a loss of confidence. The downside is that the durability is terrible, after only a few miles on very tame hardpack in Claremont Wilderness Park, pieces of the outside chevrons went missing. Each run, I find more and more of the shoe missing. I’m going to contact Altra about this and see if it’s just a defect with my pair. I’ve read a few reviews from other runners and it seems I’m not the only one, but there are others who haven’t noticed this as a problem. Look like a great shoe. Have you had any experience of the inov8 range and how would these stack up to the inov8s? I’ve had a few Inov8 models for both hiking and running. My first lightweight hiking shoe was the Roclite 295, and I’ve run and hiked in the Trailroc 255 which I really like. I’ve also done some running and hiking in the newer Race Ultra 290, which felt nice, but was a little too sloppy for my taste. What ever came of the busted tread? My pair is doing that after only 4 miles. Have you contacted altra? Is it just a defect, or are the lone peaks just weak? James, it only got worse for me. I stopped using them for trail running, and relegated them to walking my dogs on fire roads. Still, the tread seems to be disappearing at a fast rate. I’ve worn them for about 30 miles since that review and they look twice as bad. I haven’t written Altra yet, but your comment has reminded me to do so! Thanks. They contacted me after I left a not so good review on their website. They asked me for a picture of the “defect”. Maybe that’s what it is, a defect. I find mixed reviews of them where only some people report this issue. I guess I’ll see what they say. I’ll take a pic and send them in. Out of curiosity, do you have the black or the yellow? I looked online and it seems like it could be early versions of the yellow that have this problem. I was hoping to get 400 miles out of these as well, and they were one of my top candidates for John Muir Trail this summer. It’s a shame, because I love everything else about this shoe. I have the black ones. And yea, I love everything about them as well, minus the weak outsole. I was planning on using these for long trails this summer, too. No news yet. I’m going to email them updated pictures of my Lone Peak 2.0 this week. Sorry to hear you’re having the same problems with the shoe as me. Unfortunately this has been a defect of their rubber compound since Lone Peak ver 1.0. I’ve had several pair of Lone Peaks since it might be the only shoe model that has carried me over several ultra-length trail-runs. I now expect them to lose the chevrons because almost all the trails I run on have technical, rocky sections (sometimes with a lot of volcanic rocks). Jeff, good and bad to hear this confirmed from another runner. 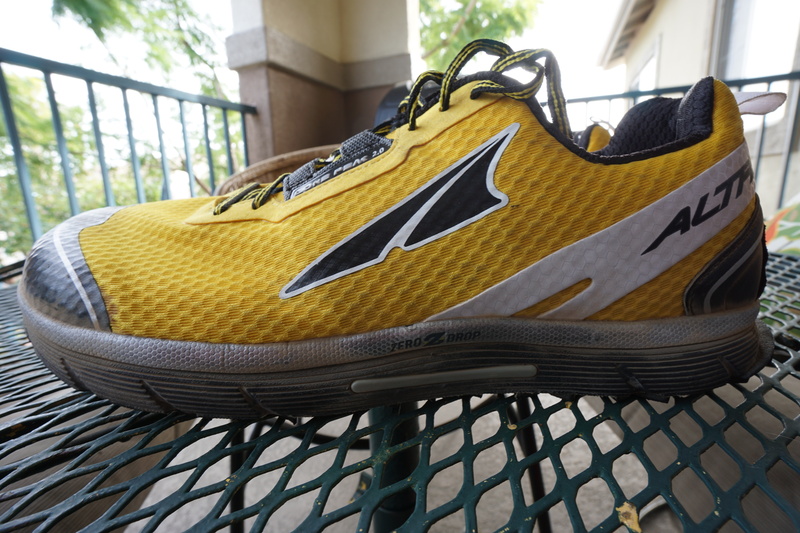 I read that Altra may be switching to a new compound for the outsole of the Lone Peak 2.5. They are also cutting 1 oz. of weight and taking some of the volume out of the midsole. Like you, I love the shoe, and have been willing to go chevron-free for the foot shaped comfort! Hey Drew, Still no news regarding your warrantee on the disappearing tread? Do they have bad customer service or did you never get around to contacting them? I was just on the JMT for 10 days N->S and saw tons of PCTers with the Lone Peak 2.0, one of which said they lasted 400-500 miles, compared to a pair of leather hiking shoes that would last 650.